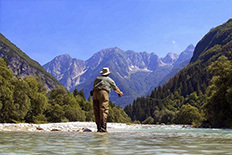 The chances of enjoying fishing in the Austrian rivers are very high. The percentage of rainbow trout is usually higher than that of brown, but there are also excellent stocks populations of Brook Trout and Grayling. In its rivers there are large fish stocks, some of them from the population support base with spawning grounds, having said this we do not mean that fishing is easy, one must work hard for it. Our company works in the biggest fishing domain of the country. The hotel we work with is the owner of the fishing rights of more than 130 km of rivers and several lakes. The fishing permit and license for these waters are unique, so we can change rivers and fishing areas in an agile way to adapt to the best conditions at a given moment. Krimmler Ache River: one of the most beautiful fishing spots on the continent, is located above the highest waterfalls in Europe. With restricted access. 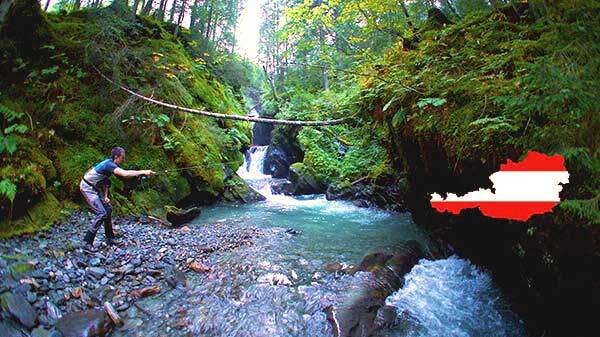 Felberbach River: is born in the drainage of Lake Hintersee. It is a river, which is uneven but fun for fishing. Amerbach River: with less flow and crystalline waters, with the possibility of catching some trophy fish. Hollersbach River: part of the lake. Alternating currents with small wells. Extraordinary setting. Stubach River: river with a great variety of species. Salzach River: main river with great flow, which only fishing at the beginning of the season or the end of September and October. 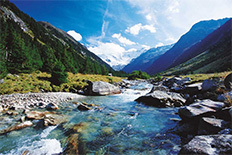 Among the lakes, we highlight, Lenisee, Elizabethsee, Hollersbachsee, Hintersee..